Cat Wine: Catnip-based beverage for your kitty in a mini wine bottle. A glass of wine is best enjoyed with friends, and now your four-legged pals can join the fun too! Cat Wine is a fun feline snack made with catnip and other all-natural ingredients. Although it’s served in a mini wine bottle, don’t worry about your kitty going on a bender. 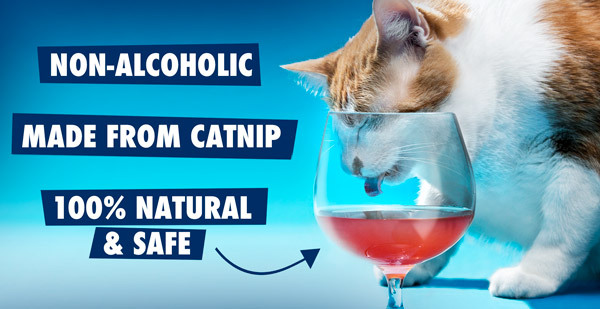 This "wine" is non-alcoholic and completely safe for your feline friend. Pour some in a dish and watch your cat go crazy for it. Then take your own glass of the real stuff and raise a toast to furry friends. Please note that we cannot ship this item outside the U.S.
Cats are like wine: they age well, cheer you up after a long day, and are a great companion on a night in. 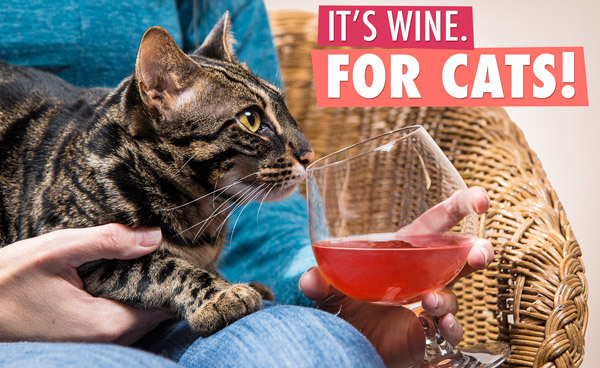 Cat Wine lets you safely share the joy of a bottle of wine with your feline friends. This specially-designed liquid snack is stored in a plastic container shaped like a mini wine bottle. Unscrew the cap to entice your kitty with a saucer of the tasty stuff. If your cat likes catnip, they’ll go crazy at the smell of Cat Wine. If your cat isn’t predisposed to the scent, they’ll still enjoy the notes of beet and sea salt as they lap up their treat. We recommend serving in a stemless saucer. Wine is like catnip for some of us humans, so it’s only natural that catnip should be infused into wine for our feline friends. The pet version is completely safe for animals (non-alcoholic) and uses 100% all natural ingredients. 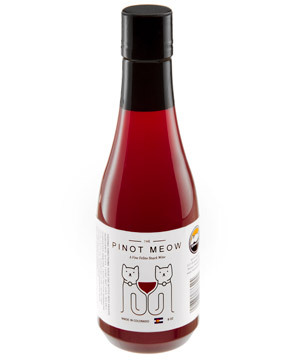 Cat Wine features tasty ingredients like organically-grown catnip, sea salt, and beet juice. What it doesn’t contain is alcohol (which means you won’t have to worry about your cat texting you at 2am looking for a DD). Help your cat get through Mondays. 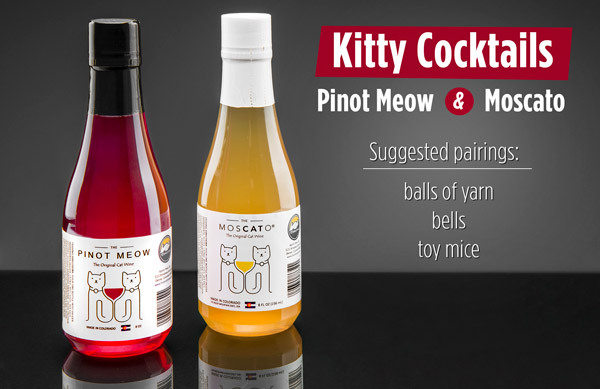 Cat Wine is available in two flavors: Pinot Meow and Moscato. Both varietals are made in the USA with the same delicious all-natural ingredients. Grab both flavors to see if your furry connoisseur prefers a red or a white. And don’t let your cat tell you they prefer their white chilled; both flavors can be served right out of the bottle at room temperature. The makings of a truly fancy feast. Question: What happens if I drink it? Answer: Cat Wine is not designed for human consumption, but it’s not toxic. Nothing bad will happen, but you probably won’t like it very much. We did some research on this. Question: What happens if my dog drinks it? Answer: It’ll probably be gone pretty quick! Cat Wine does not have any adverse effects on dogs. However, they may prefer Beer for Dogs. Question: How will this affect my cat? Answer: Cat Wine will have the same effects as catnip. Most cats are intensely drawn to the scent and tend to mellow out when they eat it. Of course, this will vary from animal to animal. Question: Does it get better with age? Answer: Cat Wine does not age the same way as human wine. The manufacturer recommends using within six months. After opening the bottle, refrigerate and use within 30 days. Question: How are the two flavors different if they use the same ingredients? 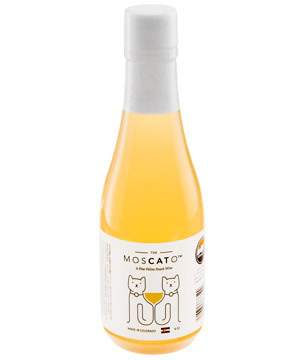 Answer: The Pinot Meow uses red beets and the Moscato uses yellow beets. Otherwise, they have the same tasty ingredients. Question: Does it require a corkscrew? Answer: Cat Wine has a twist-off cap.